All sets of Questions & Answers, provided by Train4sure as part of Train4sure Testing Engine, are put together, reviewed and verified by experienced IT staff and certified IT trainers who have decades of experience with each respective technology and certification area. Train4sure keeps constant track of all certification exams and monitors changes introduced to them. As soon as new questions, topics or other changes are introduced, they are verified and added to Train4sure products. This way, Train4sure customers always have access to the latest and verified exam preparation materials. What sets Train4sure apart from other providers of exam preparation materials is its unparalleled customer service. Whatever question or challenge you may have, be it an expired product, exam query or any other question, our team is ready to help. At Train4sure, we are confident in the quality of our products as they have been thoroughly checked by experts and will help you to prepare for the exam as well as possible. Don't; worry, if you have failed your exam at your first attempt. We offer our customers to choose any other exam available on our website for their preparation. Please note that before claiming the guarantee, you send us your exam result, testifying this fact. Without doing so, you can't use this offer. Please, submit your Exam Score Report in PDF format within 7 (seven) days of your exam date to support@train4sure.com. Train4sure Billing Team will verify the authenticity of your purchase and all submitted documents to avoid online fraud. As long as the documents are in order, the new product will be delivered to your account within 3 (three) days after we have received your request with all supporting documents. Please note that the Guarantee applies only to single-user licenses purchased directly from Train4sure. 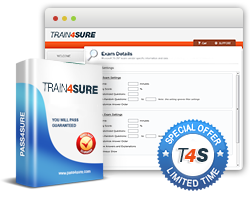 Thanks to Train4sure Guarantee, you'll pass the exam, get free update within 90 days after the purchase (if there's any) or in case of failure, receive one more product available on our website and necessary for your preparation. Your purchases of Train4sure Learning Materials are absolutely risk-free. To claim the guarantee, customers should contact support@train4sure.com. The request must be sent within 7 (seven) days after exam failure. The purchases of Unlimited Access Mega Pack (3 months, 6 months or 12 months) and Cisco exams aren't covered by the Guarantee. Train4sure.com reserves the right to make the final decision regarding all guarantee claims, including unique cases not listed above.